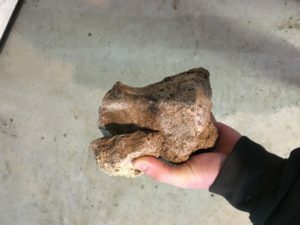 Recently we removed a large silver maple and found a chunk of concrete inside! Many years ago, it was believed that putting concrete in open wounds would help “seal” the tree, thus preventing further spread of decay; however, studies show that leaving a tree do its natural CODIT process is the best for sealing the tree. Read the full story of our large maple removal at www.facebook.com/haastreecarellc. Previous PostWisconsin Arborist Association Winter ConferenceNext PostWhite Pines in a Tight Spot!